of uncertain origin, though common in the British Isles. beard or with leaves growing out of his mouth and nose. appreciation of simple nature, the GreenMan will come to you!" The Green Man as Fool has always baffled me, so I am very glad that you posted this particular card. I do know the Green Man as the male fecund aspect of Nature, the Guardian of the green wood and protector of the throne of the King. I can follow his move into being “Robin Hood”. I can see him as, even, the Emperor Card, himself. He is such a powerful figure, and to have managed to come down to us today, his form relatively unchanged is just more proof of his enduring power. I do not see him as being the same as Cernnenos, the Great Horned one, because his kingdom is of the animals, not the woods and earth itself. In this, I tend more to Mark Ryan’s’ (of the Greenwood Tarot) view. He has the Green Man as Emperor. But here I am, looking at the Fool, trying to find my way to seeing him that way! (Paraphrasing like mad, here) The Green Man is outside of our normal order of the day-by-day stuff. He is a wild card, and will take you places and ways you’ve never considered before. He is the sudden storm that washes away the clear path before you and sets you down in another place. If you follow his call, you will discover riches within. “Spiritually you will receive unexpected guidance and fresh inspiration with experiences far beyond the usual. It is the call of the Otherworld to seek and to know." And, ”It is a leap into the dark”. Which, in this context, we have to admit, is not all bad! Does he work as the Fool to anyone else? And why? Or Why Not? Since getting this deck, I have had this card on my altar. When i first shuffled and looked at my deck, this card striked me the most. For some reason, the GreenMan picture seems to jar with me. He isn't the innocent fool or the fool on a cusp of realisation (like in the Haindl), the GreenMan knows all that is wild and is daring us to break through to him and feel that raw spirit and instinct and drive we all have and battle with the 'norm'. I'm having a bit of a staring match with this GreenMan, he's challenging me to look at him, to let him take me on a crazy trip. So , stubborn control freak that i am , i'm challenging him to keep knocking me off centre when i see him and face the discomfort. To me his eyes are all-knowing, they aren't innocent, only seeing what you aren't seeing whilst seeing your true desires. Its like his gaze just looks right through you, but doesnt judge you either. The GreenMan is wild, he's objective and watches us as we grow and learn to control but use and enjoy the wildness and the thrills we get when we walk into the depths of a dark forest. Thinking about it, seeing the GreenMan as an emperor probably wouldnt work for me, because the GreenMan doesnt have an authority over the land or the forests, He simply is and does as they are because thats how it was meant to be, not because he willed it to be. Overall, i like the GreenMan / fool, even though his stare does strikes me slightly. This may be completely off-the-wall, but Sacred Circle's GreenMan strongly reminds me of Thoth's Fool, especially in the green Thoth deck & in that Fool's mad eyes. That spirit of the wild. The primal life force of untamed natural instinct that reverberates through the woods. The spirit of Nature, a law unto itself. It works as The Fool for me. I continue to re-read the series because they are so fascinating & compelling, entwined with the Celtic, Drudic & Arthurian legends. Five will return, and one go alone...."
"Over Sea, Under Stone" introduces us to 3 children, Simon, Jane & Barnabas Drew, who spend a Summer in Trewissick, Cornwall, at their Great-Uncle Merry's home. Their discovery of a map leads them on a quest for a treasure that is the grail--a trail that is fraught with hidden dangers as they unwittingly become involved with the forces of the "Light" & of the "Dark". They also discover that Great-Uncle Merry is more than a family friend with the honorary title of "Great-Uncle": he is a servant of the Light. "The Dark is Rising" introduces a 4th child, Will Stanton. He discovers on his 11th birthday that he is the last born of the Circle of the Old Ones, servants of the Light. He is taught by Merriman Lyon, an Old One. In "Greenwitch", the first 3 children & the 4th meet. There they encounter the Greenwitch, a creature made of tree branches & leaves for an annual ritualistic observance by the townspeople. It is this series & in particular, the book "Greenwitch" that contributed to my interest in decks such as the Greenwood & the Sacred Circle. The books tell an epic story that draws upon the author's wealth of mythological lore. Although the books are geared for children in the 9 to 12 range, in my view, they also appeal to an adult audience. They are imbued with the magick that touches all great stories (like that of the Narnia Chronicles by C.S. Lewis). & like all great stories, only get richer with each re-reading. I mention these books because I see a correlation between the GreenMan & the Greenwitch. For those who are so inclined, I guarantee a great read! 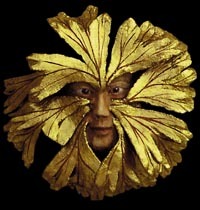 Sacred Circle's GreenMan strongly reminds me of Thoth's Fool, especially in the green Thoth deck & in that Fool's mad eyes. That spirit of the wild. The primal life force of untamed natural instinct that reverberates through the woods. The spirit of Nature, a law unto itself. And Inanna_tarot said: "...the GreenMan picture seems to jar with me. He isn't the innocent fool or the fool on a cusp of realisation (like in the Haindl), the GreenMan knows all that is wild and is daring us to break through to him and feel that raw spirit and instinct and drive we all have and battle with the 'norm'... I'm having a bit of a staring match with this GreenMan, he's challenging me to look at him, to let him take me on a crazy trip....To me his eyes are all-knowing, they aren't innocent, only seeing what you aren't seeing..."
Thank you both for your posts on this....I think I'm getting it now. Yes, I've been really really disconcerted with this Green Man's stare, and his 2 front teeth, besides...he's a dangerous dude, who'd abandon you in a Mexicali Hotel with no money and broken illusions, in a heartbeat. Not, you understand, out of meanness, but simply on the premise that you could take care of yourself or you wouldn't be running with him! He's an educational experience on wheels. And, MeeWah, he does have that Crowly mad fool's stare...............I'm developing a new understanding of just why I haven't much wanted to connect with this card!!! There is nothing innocent about him, and I knew him well, in my younger days. Sometimes I ran with him, sometimes I was him. Matter of fact, if our family had a Crest, he'd be on it!! And Inanna_tarot said: "... He isn't the innocent fool or the fool on a cusp of realisation (like in the Haindl), the GreenMan knows all that is wild and is daring us to break through to him and feel that raw spirit and instinct and drive we all have and battle with the 'norm'... To me his eyes are all-knowing, they aren't innocent, only seeing what you aren't seeing..."
Yes, I've been really really disconcerted with this Green Man's stare, and his 2 front teeth, besides... He's an educational experience on wheels. And, MeeWah, he does have that Crowly mad fool's stare...............I'm developing a new understanding of just why I haven't much wanted to connect with this card!!! There is nothing innocent about him, and I knew him well, in my younger days. Sometimes I ran with him, sometimes I was him. Matter of fact, if our family had a Crest, he'd be on it!! Yes. Although The Fool may traditionally or otherwise be synonymous with innocence &/or purity, The Fool holds within him all experiences & not just the potential for same. This Fool speaks of a freedom borne of not innocence, but of its opposite: that of knowledge; a wild abandon from experiencing that knowledge. May even be Bacchanalian (is that a word?). More like Pan or of Herne the Hunter (with apologies for any crossing or blending of the unlike). definate Crowley Fool stare.. hmm, i was thinking about pushing myself to having them both on my alter to see if i can out-stare them, but i think if i did that i'd just hide away instead lol. To me he looks proud,and his stance makes me think that he is asking me to play a Truth or Dare game! Do I dare run with him and find out the truth about myself or the question I asked, do I really want to delve into the unknown.